Here is a preview segment from my short cartoon. It's most of a sequence, there are a couple of shot's which I haven't Cleaned Up yet and so they weren't included. I won't be putting up a lot of video's from "Aye-Aye" anymore, not until the cartoon is finished anyway. I will be uploading video's from other animations I work on though. This is just a short sequence from my cartoon. I'm quite deep into this now and I would really appreciate any feedback you could give me. Be it on Style, character design, animation timing, anything really. I just need to know that people are actually going to want to watch my cartoon when it's finished. Please leave a comment here or on the video page and share this preview with your friends too. All help is welcome. 3 of the shots in the segment were made in 2007 while the 4 other shots were all made 2010. The way each of the shots was put together varies greatly. In 2007 I was in my final year at Freelance Animation School. Those shots were Cleaned Up traditionally with pencil and paper, then Scanned one frame at a time. 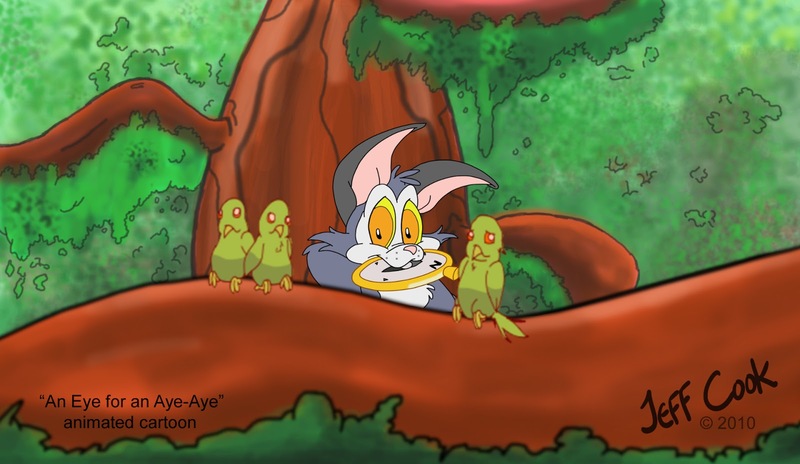 The animation frames were coloured in Toonboom and the backgrounds were coloured in Photoshop. Toonboom would trace over my Clean Up drawings and Vector them. The quality of the vector depended on my pencil clean up along with the size and quality of the original drawings. Doing it this way, any dirt or registration marks left on the paper during scanning would need to be erased later in Toonboom. It wasn't always possible to find all the bits of dirt on the frames. Traditional Hand Drawn animation - Pencil and Paper on an animation desk. If I'm happy with the timing of the shot then I start Digitally cleaning up the captured frames. I do my clean up in a program called 'Pencil'. Digital CU can take the same amount of time as Traditional CU. Although pencil has colouring capabilities, I like to do all my colouring and background art in Gimp. Then when the shot is cleaned up and coloured I use a program called Wax for the compositing. Audio is done with Audacity and then my final edit is made in Pinnacle Studio 12 (which isn't Open Source). I will go into these steps in more detail one day but that probably won't be until things wrap on "Aye-aye". I am just getting into animation this week. I am a 4 time graduate (two of them in film making) and excited to hand draw my cartoons. I love your style and am excited to see the final version of aye-aye. I am trying to figure out the best way to get my drawings into the computer and what size and type of paper to use. For video editing I use final cut pro studio 2. Thanks for looking at my work. I'm glad you like it. Everyone will answer your question differently. Personally, I redraw, Clean Up or Trace my drawings in the computer and so I don't worry about high quality images at that stage. You can draw every image on paper and use a scanner to get it into the computer. I use a low resolution Webcam to capture each drawing. Then I redraw them in the computer. I hope this helps, feel free to email me if you need more information.